You know a thing or two about stacking up piles of cash, right? So why not show off that expensive lifestyle with some extravagant apparel? You need an outfit that says you’re a new king in the game of pimping! Check out this awesome Mac Daddy Pimp Costume, it will be perfect for standing out from the crowd and building up that street cred. This flashy costume will make it look like you go to sleep every night on a bed made of money, like you drive a brand new cadi on a daily basis, like you only eat brand name cereal. When you wear this amazing pimp outfit, people will know that you only accept the best of the best and the freshest of the freshest. Yes, it’s true that in the wild a zebra’s stripes are a defense mechanism meant to help one blend in with the rest of the harem and ward off predators. However with the zebra stripe prints on these banging threads, blending in is the last thing you’ll be doing. 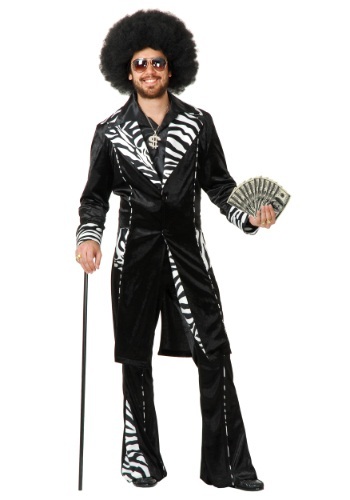 Grab an awesome Afro wig to top off this Mac Daddy costume along with a classy cane and a glammed out goblet to complete this pimping transformation. When you’re walking down the street from one Halloween party to the next people will think that you're headed to the Playa’s Ball or to an exclusive pimps-only club. Just make sure to keep your pimp hand strong in case any ignorant wanna-be gangstas decide to mouth off to you. The pimp game is all about respect and you can't stand for even a single word of disrespect hurled in your direction. Was mine a trade-in or a return? The outfit wasn't folded like new, but rolled up and placed in the bag. The coat is all wrinkled and will need to go to cleaners because the collar won't stay down. Not sure if I was a trade-in outfit instead of new. It does fit and the color is spot on. It's a one time event and I don't have time to wait on a return. The picture is whole lot better than the actual product. It looks like a suit, but it more pajama material. (Terry Cloth). I'm sorry that you had this issue with the costume, did you happen to reach out to Customer Service with this by chance? They are always able to help! Sizes are not true to fit. The costume is not true to fit, A 3x should have fit with extra room, but it does not.